Investing and payout is conducted via Paypal. All Paypal fees are covered by Appbackr. I initially overlooked that Apple releases the money roughly one month after the sales took place, but Appbackr support explained that after I contacted them. Later in a new release of the interface Appbackr added information about upcoming payment dates, an information I previously missed (see screenshot below). The prelapsarian state of confidence ended abruptly, when Nov. 11th passed after I had only received payout for one of the 3 apps that were due to be paid. 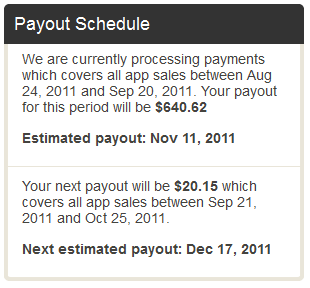 The payment schedule notice in my dashboard stayed unchanged. Used that things go wrong in startups and delays are not uncommon, I remained unfazed, but after a week with no notice I contacted Appbackr again and asked for an explantion. I was told that the developers in question had not payed despite Appbackr’s invoice and that investors would receive more explantion later the same day. So far I felt that Appbackr had not done anything wrong other than failing to inform investors earlier and I also felt I had not been informed beforehand that there is a real risk that developers would fail to comply to the agreement despite earning the money from the sales. Later that day I received a formal information by Appbackr with an excuse from Yan Auerbach, Founder and COO of SpeechTrans Inc. which I found rather lame: ‘According to SpeechTrans, they used the wholesale purchase payments and the subsequent retail sales to fund development of an Android app, saying that they had been unclear that payment would be due to buyers after the Apple retail sales occurred.’. Again, while a major surprise, that was not really Appbackr’s fault. But it went on to state that Appbackr and SpeechTrans agreed to postpone payments by SpeechTrans until January, 13th 2012. They agree to postpone payments of money that is due to me? Without even asking or informing me before? I don’t like it when the rules get changed in the middle of the game. I would have expected them to take steps to enforce the agreement. And i feel even more weary as there is still no information why iScape has not payed. Will they be allowed to postpone payments too, just by asking? Appbackr is an interesting concept, that could yield good profits to investors. But it seems that Appbackr is ‘soft’ on developers, either having no means to prohibit violations of the agreement or not willing to do so, as they probably need good relations to developers since influx of new apps might be more vital for their business model then influx of new capital (investors). Another indicator supporting this theory is that none of the concept apps I invested in launched on time. Some have been postponed (more then once) with explanation given, some are overdue without any information. The later is not acceptable in my view. It is vital that as much information as possible is given (through FAQ or otherwise) beforehand. Most p2p lending startups I follow are good on this, many use forums as addentional information ressource. While Appbackr staff was friendly and supportive at all times, I did feel like I have to pull informations needed again and again. Maybe I am the more cautious investor, but each financial startup needs to remember that it lives on the trust the investor has to extent to this unknown startup and overcome not only his wearyness of unknown risks but also the thought of falling prey to a scam. Should this trust be endangered, then this could harm the business model seriously. 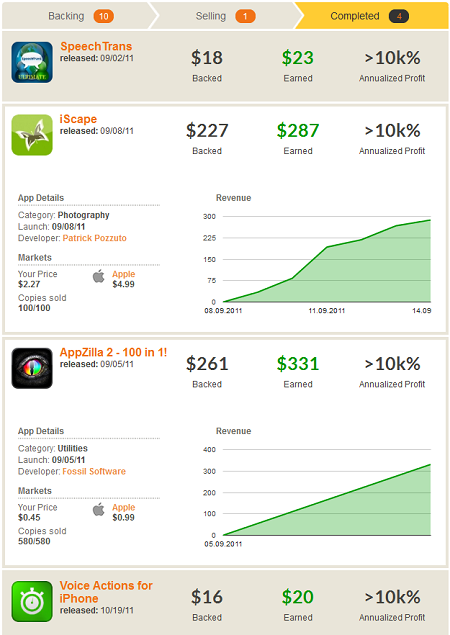 UPDATE Dec., 1st: The outstanding payment for the iScape app arrived today. I ve just backed The Naked Gun-ICUP, through appbackr. I would like to knwo from your experience, the money that appbackr will return to my paypal account, it will be reduced by a paypal commision?For example I invest 100 dollars, I buy copies worth of 99.06 dollars (for an unknown reason to me). After the copies are sold, will I get 134.16 dollars returned in my paypal account (as appbackr writes) or should I have a commision from paypal (because someone send me money), and how much?I am afraid that finally the profit is lower than it seems. there are no paypal fees deducted (they are paid by appbackr). The uneven figures (99.06 instead of 100) is due to matching the next lower mulitiple of a copy wholesale prices below the amount (100) you entered.